Return Census to School April 26th - Thank you! It is hard to believe how quickly this year has flown by. As we move into the final 2 months of the school year, teachers and school staff will begin to form the classes for the 2017-2018 school year. Staff put a lot of thought into your child's learning styles and the social dynamic when they build the classrooms. We also welcome your input. If you would like to share information about your child's learning style with us, that you feel would benefit them as we do the class placements, please e-mail Jessica Feldberg (jessica.feldberg@tdsb.on.ca) before May 1 st , 2017. Please note we cannot accept specific teacher requests. LET'S CELEBRATE THE 100th GARDEN FÊTE! May 27th is the date for this milestone opportunity as our community comes together to honour another great year at Brown School. - Brown School website (www.brownschool.ca). Stay tuned: next week, we'll unveil the logo for the 100th GARDEN FÊTE! This week the Eco club will be collecting any gently used or even well used clothing and textiles, in any condition. Help keep materials out of landfill sites and give them a second life, either for someone else to use or to be re-purposed as stuffing for furniture etc. Diabetes will collect and sort all materials, will sell what is in good condition and will shred what isn't, to be used in other ways. Old paint shirt? We'll take it! Please bring donations to the large drop-box marked Diabetes which is located outside the office early next week! Make sure you are following @BrownPSPanthers on Twitter! or Black and Red every Friday! Please note that our Communications Archive can be found at - http://brownschoolbulletin.blogspot.ca. ON MAY 27TH, LET'S CELEBRATE AS GARDEN FÊTE TURNS 100! Please save the date for this milestone opportunity as our community comes together to honour another great year at Brown School. 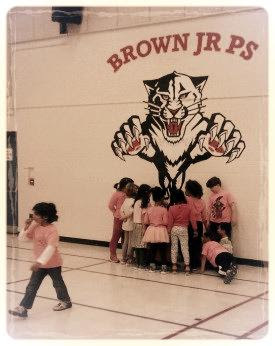 Our students wore their pink loud and proud to remember the International Day of Pink and to stand up against bullying. Way to go Panthers! Please see the attachment regarding an amazing information session for parents being offered on Monday, May 8th and held at Brown. Daycare is being provided for children. The team works in tandem to coordinate with other committees and administration to send out email blasts and the weekly Panther Press. Technology background necessary. Ideally an active volunteer in Brown Parent Council and available for Parent Council meetings. Training is provided. Next Wednesday, April 12, Brown will be participating again in the International Day of Pink. In addition to raising awareness about bullying, trans/homophobia, it is an opportunity to discuss gender stereotypes and celebrate diversity in all forms! Please work with us to ensure our students use the road signs properly and, in particular, use the Cross Walk to cross Poplar Plains Road. If you have purchased milk for your child, please remind them to come and pick it up at the beginning of lunch. Grade 4/5 - Congrats on an amazing season thus far, the team is off to the Conference Championship game...details to follow soon. Grade 6 - Our team is playing in the Semifinals on Friday afternoon, good luck, Go Panthers! Wednesday April 12 and Thursday April 13 @ 7:15am at Winston Churchill Park. At the conclusion of the tryouts the team along with the coaches will walk back to school together. A change of shoes and socks for the rest of the school day are highly recommended, the park is still quite muddy. if it's raining, we'll tryout in the Gym. Congratulations to the Grade 6 team who won the Conference Championship on April 6th. The team is heading to the City Finals on April 20th. More info will be emailed to the parents regarding the City Finals very soon. Many of the Grade 4 to 6 students have been running the various Track events in PE class. We have started to put together the team but have many spots still to fill. The following events will take place in your child's PE class: 80m, 200m, 400m. 800m - Friday April 28th @ 7:15am. If your child (Grade 4 to 6), makes it on to the Track and Field Team, we will have our 1st competition on Tuesday May9th @ Birchmount Stadium. A letter with detailed information about our 1st meet will be sent home with your child at the end of April. Camp season is upon us! Help support Brown Public School by buying the things you already need! Mabel's Labels is offering early bird pricing for their Sleepaway and Day Camp Label Packs for 2017. Early bird pricing is only available until April 30th. All purchases made through this link on the Mabel's Labels website throughout the year help support our fundraising goals! Please see the attachment. As always we are here if you have any questions. After the March Break we will be trying something a little bit different! If your child has forgotten something at home, such as their lunch or their project - we will ask that you drop it off in the office and place a sticky note on the item with your child's name. As we would like to avoid calling into classrooms and interrupting learning time, we ask that you tell your child to check for said items at a convenient break in the day (e.g. recess or lunchtime). Please see the attachments if you are interested in signing your child up for Act One (Beauty and the Beast), Hatch (coding & keyboarding programs), Chess and/or Mad Science. Please see the attached flyer regarding a Social Media Presentation for parents and caregivers. The presentation is being held at Cottingham Public School on Wednesday, March 29, 6:30-7:30pm and is open to all families at Brown P.S. as well.